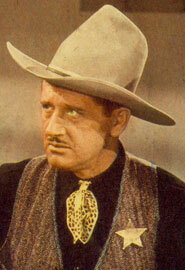 Jack Ingram was one of the top heavies in B-Westerns for 20 years from the mid ‘30s to the mid ‘50s. 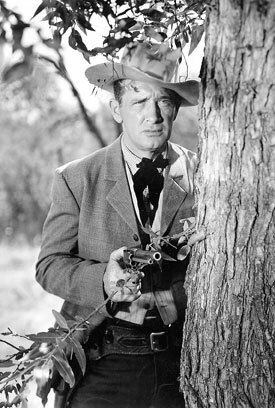 Ingram was also featured in at least 49 serials, becoming one of Sam Katzman’s “regulars” at Columbia in the late ‘40s. John Samuel Ingram was born November 15, 1902, in Chicago, Illinois, to Irish parents, Jacob Ingram (born in Ireland) and Ann Fitzgerald, an Illinois native. Orphaned as an infant, he spent his boyhood on his uncle’s farm in Wisconsin where he acquired his love of animals and his riding abilities. Then the family moved to Dallas, Texas. At the young age of 15 he was tall for his age and anxious to join the Army. With consent he lied about his age and enlisted, serving with the 8th Field Artillery overseas where he was wounded and gassed. He spent two years recuperating at a French hospital. Because he lied about his age, saying he was born in 1900, many records to this day still reflect that incorrect birth year, including Social Security records. However, his California death certificate testified to by his widow indicates the correct 1902 date. Although he found a natural ability to make others laugh while in WWI service, he did not immediately gravitate to showbiz upon his discharge. Jack enrolled at the University of Texas to study law, but eventually became more interested in performing. He became a regular member of a successful traveling minstrel show and later joined and toured the country with Mae West’s stage shows. He also traveled with the Donald MacGregor Shows out of Ft. Worth, Texas. Jack was spotted on Broadway in West’s “Diamond Lil” (‘28) and signed by Paramount in ‘29 because of his knowledge of horses and his ability to perform difficult stunts. New to the business, he learned everything he could behind and in front of the camera as he performed stunts and even worked as an assistant director on several films through the early ‘30s. While performing a leap from a high rock onto a horse in “Charge of the Light Brigade” (‘36), the horse shied, throwing Jack’s timing off. When he fell he broke his arm. 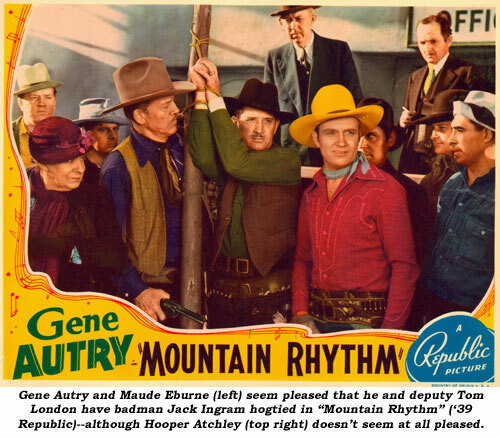 He’d begun doing bit roles in Republic westerns in ‘35 but by ‘36 moved seriously into acting fulltime. He appeared in at least 10 films and two serials in ‘36. 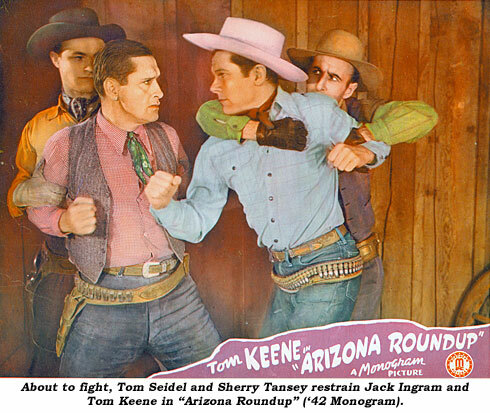 In ‘37 he gave a try to being a comedy sidekick as Kermit Maynard’s half-wit pal, Spud, in “Valley of Terror”. 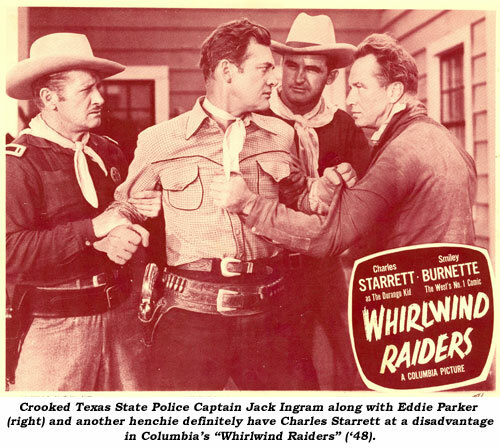 This wasn’t right for Jack and it was back to heavies, completing some 14 other films and three serials in ‘37. Throughout the ‘30s and ‘40s Jack worked freelance at Republic, PRC, Universal, Monogram and Columbia. Many years he made as many as 25 films. 1944 was a banner year for Jack. Not only did he make 22 movies and three serials, he found time to marry Eloise (Lou) Fullerton, a Hollywood columnist and publicist. They purchased 200 acres of what had been part of the old Charlie Chaplin estate. The property had previously been purchased by Dave O’Brien and James Newill (The Texas Rangers at PRC) with ulterior motives. The two actors bought the property in an effort to avoid being inducted into WWII service by passing themselves off as goat farmers in the belief the government would assign them a deferment for raising farm animals. 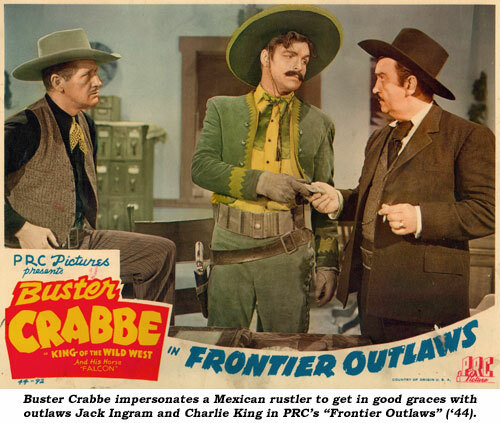 The subterfuge wasn’t necessary as the cowboys were soon both classified 4-F. Free of their wartime fears, and perhaps tired of getting up early to tend nearly 100 goats; they sold the property to Ingram, whom they knew well from his many badman roles in their series. Ingram purchased an old bulldozer and, with the help of several badfellow pals (Pierce Lyden, Kenne Duncan, Lane Bradford), built a Western street set. The property included a well-landscaped house that became Ingram’s home. (It can be seen in the background of “Mark of the Lash” with Lash LaRue.) 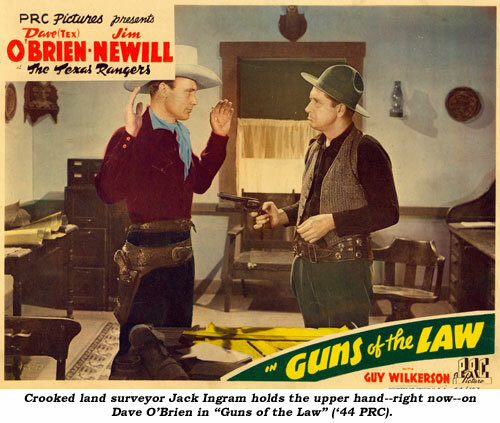 Dozens of Westerns and TV episodes were lensed at Ingram’s ranch. In filming days, the entrance was reached from a side road off Topanga Canyon, but now you can drive by the property (the house is still there although the Western streets are gone) on Mulholland (on the right about a half mile after you turn off Topanga going west). The open fields next to the house are where the Western streets once were. 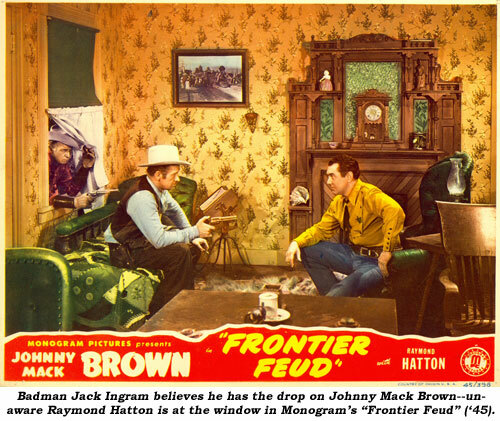 Failing health caused Jack to sell the ranch in 1956 to 4 Star Productions who continued to use the site for a number of years in their various Western TV series. Moving to Encino, Jack bought a 55 ft. yacht, berthed at Long Beach Harbor, on which he enjoyed himself during his retirement. He also rented the yacht to film companies, including ZIV’s “Sea Hunt”. While fishing at their lodge in Oregon, Jack suffered a heart attack and was hospitalized for a month. Returning to California, his recovery was slow and one of the nicest and one of the busiest men in Westerns and serials (with or without his mustache) suffered a second heart attack and died at West Hills Doctor’s Hospital in Canoga Park, California, February 20, 1969. Ingram is buried at Oakwood Memorial Park in Chatsworth.